Johannesburg - Thousands of workers are expected to take to the streets on Wednesday for a one day strike as the South African Federation of Trade Unions (Saftu) plans to make the country “ungovernable”. The federation marched to parliament on April 12 and handed over a memorandum of demands but they say that the response did not address their concerns and workers will embark on nationwide action to put pressure on members of parliament to reject several labour bills making their way through parliament. Saftu, led by dynamic general secretary Zwelinzima Vavi, was formed exactly one year ago. Fin24 takes a closer look at their plans for the general strike. How: Section 77 of the Labour Relations Act (LRA) allows workers to undertake protected strike action to promote their social and economic interests. Saftu’s application to the Section 77 Sub-Committee of the National Economic Development and Labour Council (Nedlac) was unsuccessful but three trade unions affiliated to Saftu; NUPSAW, ICTU and Salipswu made a similar Section 77 application to Nedlac and it was granted. On Wednesday, all employees, regardless of whether they are Saftu members or non-unionised may join the strike under the ‘no work, no pay principle’. Who: According to unaudited figures, Saftu has 800 000 members. The largest affiliate is the biggest trade union in SA, the National Union of Metalworkers (Numsa) with approximately 300 000 members, mostly in the manufacturing sector. “We want everyone to join, in particular appealing to rank and file members [of other unions], many of them will be disgusted that their leaders voted for the [labour law] changes, without a mandate”, Saftu spokesperson Patrick Craven told Fin24. Where: Saftu is expected to announce the nationwide routes at a press conference on Monday. Parliament is currently considering amendments to the Labour Relations Act‚ the Basic Conditions of Employment Act‚ and the new National Minimum Wage Bill. “Various amendments to labour laws will make it incredibly difficult to strike, it’s already quite difficult,” Craven said. He said that the new labour bill making its way through parliament will include more rigorous requirements for pre-strike balloting and that this will be difficult for smaller unions with limited funds. Craven added that the proposed amendments to the LRA will also allow for the Commission for Conciliation, Mediation and Arbitration (CCMA) to intervene in strikes deemed to be lengthy and/or violent. Saftu objects to the R20 an hour minimum wage agreement, which was set to be implemented on May 1 but has since been postponed due to lengthy parliamentary processes. “We want a living wage, we haven’t set a specific figure [but] we were very impressed with Marikana Lonmin workers who wanted R12 500. R20 is an insult to their memory,” Craven said. The Parliamentary portfolio committee on labour said on Friday it will refer the National Minimum Wage Bill back to the labour department to be redrafted so that it includes public input received by the committee. Craven said that the nationwide marches on Wednesday “are linked to the campaign to be recognised by Nedlac”. Saftu remains in the cold, outside of Nedlac, the forum which negotiated the minimum wage and the labour law amendments between the three other union federations, government, business and the community sector. Requirements for Nedlac membership include audited membership figures and financial statements. Saftu maintains it does not have these yet as the federation was only formed a year ago and the admissions procedures at Nedlac are too onerous. Who will not be part of the general strike? Cosatu - the Congress of South African Trade Unions spokesperson Sizwe Pamla said that while they agree with Saftu that the R20 per hour minimum wage is inadequate, it’s a starting point to improve workers’ lives and the figure is what the “South African economy could give us”. Pamla added that the amendments to the LRA do not represent a dramatic change to the labour landscape as they were already provided for in the legislation, they just weren’t enforced. At loggerheads since the formation of Saftu in April 2017, Pamla said that they have good working relations with the two other federations at Nedlac, Fedusa and Nactu and need to work with Saftu in the future. Nactu - the National Council of Trade Unions general secretary Narius Moloto said that the federation believed that the minimum wage is “historic” as it will benefit 40% of workers, currently earning below R20 per hour. 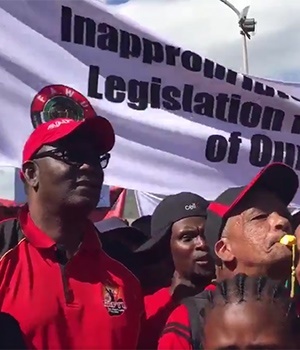 With regard to amendments to the labour law, Moloto said they will not make embarking on strike action more difficult; “we don’t really understand what they’re protesting about”. Fedusa - the Federation of Unions of South Africa general secretary Dennis George said that the organisation won’t be joining the strike as the minimum wage was negotiated with government. He added that 4.5 million workers will be covered by the R20 per hour salary and this will be “a huge benefit to the country”.